The legislature just finished its regular session. Now lawmakers gaveled themselves back into a special session after Gov. 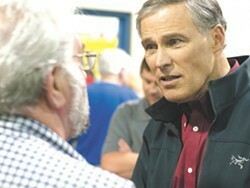 Jay Inslee insisted the legislature pass a supplemental budget. In Spokane, police have ended a hostage situation where an armed man was holding two people at gunpoint. The White House hosted a state dinner for Canadian Prime Minister Justin Trudeau, the first event held for the head of state of Canada in nearly 20 years. President Barack Obama and Trudeau have similar political styles. A former aide to Russian President Vladimir Putin died of head injuries in a Washington D.C. hotel according to coroners. Previously, he was thought to have died from a heart attack. Former GOP rival Dr. Ben Carson has endorsed Donald Trump. Meanwhile, another Trump supporter was arrested for punching a protestor at a rally. Didn't watch last night's Republican debate? Here are the highlights.